The Red Sox made a strong showing in MLB Pipeline’s recent Midseason Top 100 Prospects rankings. Five Red Sox made the list, led by Yoan Moncada, who climbed up to the second-ranked prospect in all of baseball. With the release of the updated rankings, Ian Browne of MLB.com explored the talent and depth that make the Sox system one of the best in the league. Apparently, 2004 Red Sox closer Keith Foulke is not done making a positive mark on the organization. Glenn Jordan of the Portland Press Herald discusses the mark Foulke is making as a bullpen mentor for the Portland Sea Dogs relief pitchers. 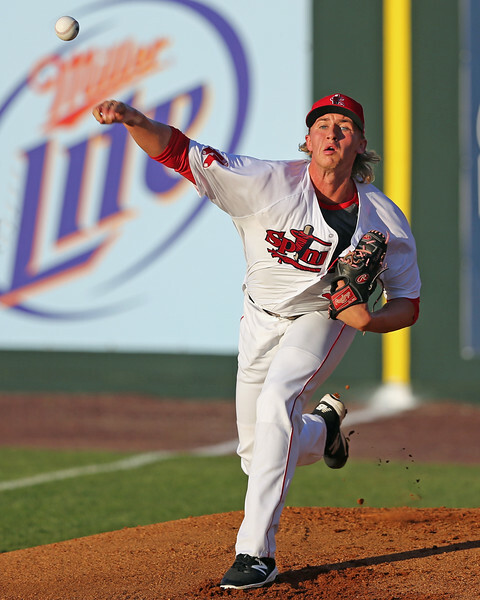 Fifth-ranked prospect Michael Kopech (pictured, above right) has been turning heads with his triple-digit fastball velocity this season, but, as Alex Speier writes for the Boston Globe, pitch speed is not the righty’s primary concern. Kopech is not the only Sox pitcher lighting up radar guns. Josh Pennington is flashing plenty of zip in his right arm after Tommy John surgery, as Speier notes for Baseball America. The trade of top pitching prospect Anderson Espinoza netted the Red Sox an MLB All-Star in Drew Pomeranz this month, but J.J. Cooper of Baseball America says that Pomeranz might not be the only benefit the Red Sox received from the deal. Seventh-ranked prospect Brian Johnson tossed six shutout innings for Pawtucket this week as he attempts to return to form after missing two months with anxiety issues. John Farrell recently talked about the lefty’s progress with Ryan Hannable of WEEI.com. Since signing with the Red Sox, first-rounder Jason Groome has yet to make his professional debut, but he was recently added to the GCL Red Sox’ roster. Fellow 2016 draftee CJ Chatham broke an 0-for-16 slump to begin his career with a two-hit day Thursday that included a game-winning knock. He then followed with two more hits and his first professional home run the next day. After the surge, he was moved from the GCL Red Sox to the Lowell Spinners. The top of the Portland Sea Dogs lineup is loaded, boasting top prospect Yoan Moncada, 11th-ranked prospect Mauricio Dubon, and second-ranked prospect Andrew Benintendi. 2080 Baseball made the trip up to Portland to get new videos of the trio. The trio was on display with a huge performances Sunday. Benintendi put on the best show with a two-homer, 4-for-5 night that, as Tyler Maun of MiLB.com notes, was a perfect exclamation point to his torrid month of July. The Red Sox signed undrafted outfielder Alexander Martinez from Des Moines Area Community College this week. He is 5 for 8 with two stolen bases in his first two professional games in the Dominican Summer League. Bennintendi’s 4-for-5 performance Sunday vaulted him to Player of the Week honors. After debuting in left field for the first time last week, Benintendi (pictured, right) has split time between left and center field, and his bat has not skipped a beat. He posted a 1.041 OPS in the month of July and ripped his 12th triple of the year this week, which lead all of professional baseball. While putting up big numbers, he also managed to complete the week without a strikeout. 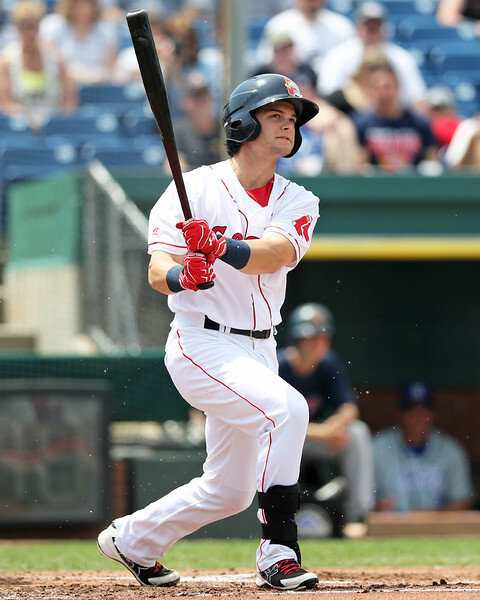 Benintendi was also named Eastern League Player of the Week. It’s not everyday that a relief pitcher with one outing nabs Pitcher of the Week honors, but Smith did yeoman's work in Lowell’s walkoff win Saturday. He entered the game in the second inning with the team trailing, 3-0, and was nearly unhittable through the eighth inning. Smith’s dominance allowed the Spinners to mount a comeback and win, 4-3. The righty was signed out of Independent ball by the Red Sox this year.